I've been on the other end for years. As a Director of Sales & Marketing at a large leisure hotel in downtown Los Angeles, I received at least one influencer e-mail a day asking to get a free stay. Instead of discussing how to collaborate with a hotel from a Travel Blogger's point of view, I thought it would be a more interesting and unique twist to talk about it from the hotel's point of view. It's still fresh in my mind, the years of receiving e-mails and phone calls from bloggers, influencers, etc. Obviously hotels and other accommodations vary; the size, the pricing and the correct person to talk to. For the most part, a blogger will end up talking to a Director of Sales, Director of Marketing or like me, a Director of Sales & Marketing. Smaller properties may not have that position so it's always best to ask. 1. Do Your Research: Please. Do your research before making contact. Go on LinkedIn and find the Marketing Manager of that hotel, call the hotel and ask for the appropriate contact, for starters. Also, research the hotel you're reaching out to. What do you love about the hotel? Why do you want to stay there? Does it fit your brand? For example, I once received an inquiry from a backpacking blogger that almost always stayed at hostels but I worked at a high end hotel. Even though this blogger had great reach, why would I want to promote my 4 star hotel in downtown Los Angeles to a mainly hostel and backpacking audience? 2. Personalize Your E-Mail: Here's an example of the type of e-mail I would discard almost immediately. I know some of you are smirking because you recognize how terrible this e-mail is. But you would be shocked to know over 90% of e-mails I received from bloggers were similar to this, or at times worse. Who are you sending this to? What's the name of the Marketing Manager? Why do you want to stay at this hotel? What is your blog link? How many MUV (Monthly Unique Views) do you have? Are you a good writer? Are you a good photographer? There's so many questions you can derive from this e-mail and to be quite frank, it's rude. 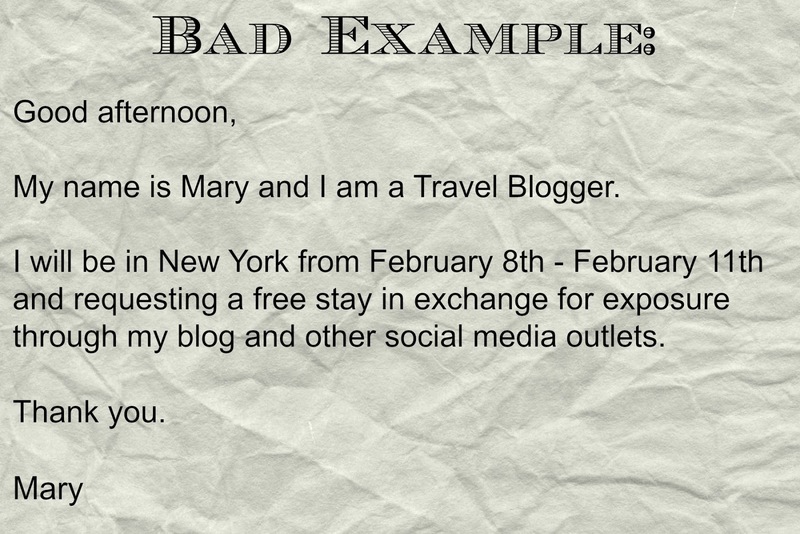 It screams to the hotel that you've copied and pasted this e-mail to every hotel in New York. 3. Have a Media Kit and/or Know Your Numbers: If you have a Media Kit, great, send it. If you don't have one, while I highly suggest you create one, at least have your numbers. Give them an example of your reach - monthly blog views, follower count on all social media outlets and brands you have previously worked with if any. Giving them a rough idea of your brand can be so helpful! 4. Be Polite & Professional: The hotel community is much, much closer than you think. Yes, we're competing against each other but we're also friends. Because of this, word spreads very quickly whether it's a troubled guest or a rude bride looking for a venue. Guess what? Even bloggers. I specifically remember getting an e-mail from a counterpart at another property that carbon copied over 20 properties in the area warning us about a blogger who basically told her off for not giving her a free night. 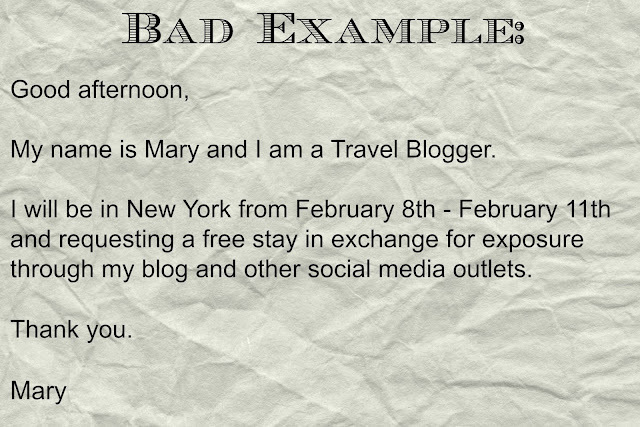 Within 10 minutes, 20 hotels in that area ignored, deleted or turned down this blogger's request for a collaboration. It seems like basic courtesy but don't forget to be polite, friendly and professional. 5. What Can YOU Offer? : Don't just ask for a stay for free. What can you offer to the hotel in exchange? Are you a great writer or a photographer? Have you worked with other hotels in the past? Send them a link to a review you did for another hotel or brand, or just a blog post you're really proud of. Remember, the hotel may offer you a stay in exchange for you to market their property - show that you're a great marketer! 6. Pick A Weekday: It's no surprise, unless you're trying to stay at a corporate hotel (properties located near business areas), you're most likely going to be offered a weekday stay. So if you ask for weekend dates, don't be surprised if they compromise a weekday, give you a discounted rate or by the rejection. 7. Be Grateful For Whatever Is Offered: Depending on what you're asking for, they may not give you exactly what you want. They might give you a discounted media rate instead of free nights or they might ask if you would be willing to stay on a weekday instead of a weekend. Whatever they offer, be grateful and gracious whether you accept it or not. Lashing out on them (this actually happens, people), well, brings you back to my example from #4. 8. 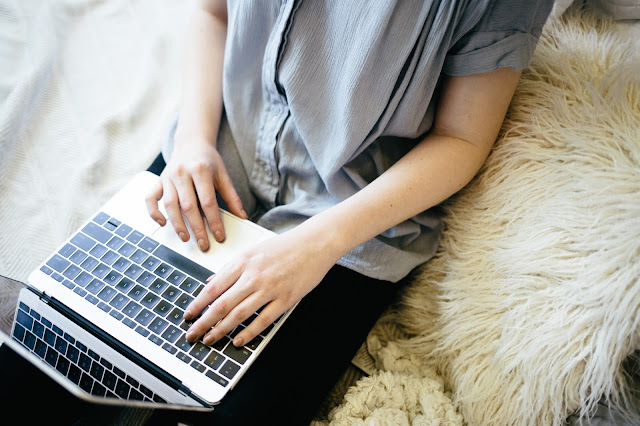 Respond Promptly: If a hotel takes the time to respond to your e-mail and if applicable, don't take days to write back. Respond in a timely manner! I used to get so many, I trashed most blogger inquiries I was unimpressed by let alone write back. 9. Always Deliver (and Over-Deliver) What You Promised: If you were able to reach an agreement with a hotel (congratulations! ), always, always deliver what you promised. If you offered 2 photos of the hotel on Instagram, 1 tweet per day of your stay and a blog post, deliver that. Also, it never hurts to over-deliver and do a little extra. Send them extra photos so they can use it on their social media or post 3 photos on Instagram instead of 2. They will notice and they will be grateful. 10. Follow-Up Post Stay: Within a few days of completing your stay, send them a thank you e-mail. Include: a sincere thank you and links to your promised blog and other social media posts. In the hotel business, we deal with rude people all day, you're sure to make an impression by writing a thank you note! That's it for now, friends! When I first started travel blogging, I definitely wondered how others were scoring stays at hotels. I had an advantage since I used to be on the other side, so I figured it out on my own. I know that's not necessarily the case for others so I hope you found this helpful. Great post Kana! It's so useful to see the viewpoint of someone "on the other side". 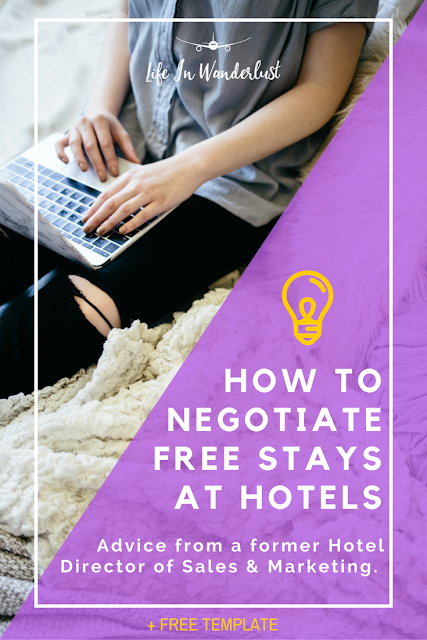 I generally don't look to get free stays since my style of traveling is quite different than a lot of travel bloggers, but this is really helpful for future reference! Great post, Kana! It's so important to be professional and not treat free stays as an entitlement. As you said, we as a community have to present what WE can offer - not just demand free sh**! Great tips and good to hear it from the perspective of the other side. This is such a great article! Thanks so much Kana! This is a brilliant post and very helpful! I am stunned you received bland emails like that! The nerve of some people! I work with a lot of luxury, boutique hotels so a lot of what you've mentioned is applicable. I've never though of this although I try to find as cheap accommodation as possible. Well done, Kana!